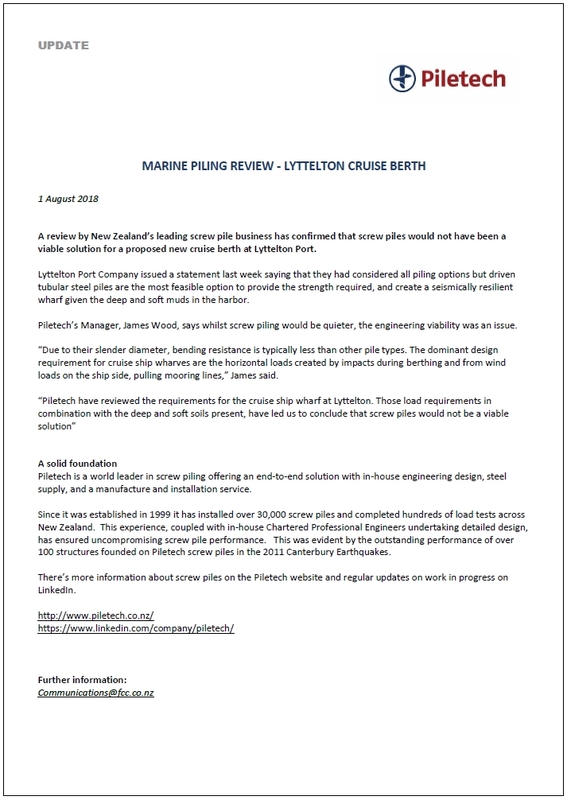 Q: Why is Lyttelton Port Company (LPC) building a cruise berth? The cruise berth project was identified in the Lyttelton Port Recovery Plan, which was approved by the Minister for Earthquake Recovery in 2015. The cruise berth is part of LPC’s Long Term Plan to ensure a resilient Port that efficiently services the region’s needs for the future. Q: Why was the cruise berth wharf redesigned? The wharf was redesigned following LPC’s research into the potential impact on marine life. This research revealed that the effects of noise from the 1200mm (in diameter) piles in the original design could not be easily mitigated to acceptable levels. The new design, which is significantly smaller, will use piles 900mm in diameter. This will significantly reduce the amount and duration of underwater noise. Modelling from our consultant AECOM’s acoustic engineers shows underwater sound energy per pile is 100 times less, and the potentially affected area of the harbour has reduced by more than 90%. Q: Does LPC need resource consent for the wharf? The Lyttelton Port Recovery Plan amended District and Regional Plans to allow the Port to recover from significant earthquake damage. These amendments allow LPC to construct the cruise berth as a permitted activity with no consent required. The Lyttelton Port Recovery Plan process included a significant amount of technical and scientific studies evaluating effects of the rule changes. This included engaging and paying for a detailed report from the University of Otago, authored by PhD student Tom Brough, Professor Steve Dawson and Professor Liz Slooten. This report specifically evaluated effects of the proposed recovery on marine mammals. LPC lodged a resource consent application for the original design with Environment Canterbury (ECan) in December 2017. Our marine research showed we needed to redesign the wharf so there was less impact on Hector’s dolphins. So we asked ECan to put our resource consent on hold. Once the new design was complete, we went to revisit our consent application and realised the new design fell within the regulations of the Lyttelton Port Recovery Plan. This means it no longer required resource consent. LPC did apply for, and has received, a Certificate of Compliance for the new design. Even though consent is no longer required, LPC will continue to implement similar marine mammal mitigation measures developed and approved in the hearing process of the new container wharf at Te Awaparahi Bay. LPC has applied for consent to allow the larger cruise ships to berth at the wharf, and to undertake minor dredging works. Q: What is LPC doing to ensure dolphins are safe during construction? Prior to marine piling beginning in October, LPC will prepare a Marine Piling Management Plan. This plan will ensure the best practicable mitigation measures are in place to minimise effects from the remaining levels of noise. Dr Deanna Clement from the Cawthron Institute, New Zealand’s largest independent science organisation, has been commissioned to produce the Marine Piling Management Plan. Dr Clement is one of New Zealand’s foremost experts on Hector’s dolphin habitat preferences and their behavioural patterns in relation to environmental influences. Along with others, Dr Clement recently completed the most intensive marine aerial survey ever conducted in New Zealand. This work is being used by Department of Conservation (DOC) and the Ministry of Primary Industries (MPI) to update the population abundance and distribution of Hector’s dolphins throughout the South Island. The final survey results of this work received a landmark endorsement from the International Whaling Committee (IWC) at its annual meeting in June 2016. The plan, currently being prepared by Dr Clement, will also include working with ECan and DOC, during this process. In order to incorporate the most upto-date data from our marine mammal monitoring instruments, the Marine Piling Management Plan will be finalised by early September 2018. Once complete, the plan will be available to anyone with concerns and all feedback will be taken into consideration. Q: What research has been done to ensure there is minimal impact on dolphins. The welfare of Hector’s dolphins present in Lyttelton Harbour was a major priority when the Port considered construction methods for the new cruise berth. In early 2017, four acoustic monitoring buoys collected more than a year’s worth of data on Hector’s dolphins’ movements around the Harbour – this equates to more than 34,000 hours of audio recordings. In 2018, LPC installed four more acoustic monitoring buoys adjacent to the cruise berth, and additional underwater devices to record the total level of noise in the harbour. This will help evaluate existing noise levels and the level of noise due to piling. By undertaking this work, LPC is leading the way in marine research for port infrastructure in New Zealand. This research is also allowing us to better understand the activity of marine life in the harbour, and the effects our activities can have on them. Our research will allow us to design structures with measures that will keep marine life safe. Q: Did LPC consider using screw piles, which are quieter, in the cruise berth design? LPC considered all piling options, including screw piles. However, this method would not provide the strength required to create a seismically-resilient wharf to berth larger cruise vessels. Driven tubular steel piles are by far the most feasible option for large wharfs in Lyttelton. A review from Piletech, the market leader for screw pile design and construction in New Zealand, is at the end of this document and provides evidence for this decision. Q: How much noise will pile driving make? Piling will occur intermittently, Monday through to Saturday, and the noise levels will be comparable to the construction of Cashin Quay 2 wharf in 2014/2015. We are mindful of the effect underwater noise from piling can have on dolphins. This was a key reason for the wharf being redesigned. Q: Why is marine pile driving starting in spring when dolphins may have their calves with them? A short period (2-3 months) of marine piling with smaller, shallower piles, which are quieter, will start in October 2018. The main wharf piles will be installed between March and December 2019. Construction of the cruise berth requires almost a full 12 months of marine piling. In order to have the cruise berth ready for the 2020/21 cruise season, piling must commence now. The Marine Piling Management Plan, being prepared by Dr Deanna Clement, will ensure the best practicable mitigation measures are in place. We reiterate the offer for anyone with concerns to review the plan and all feedback will be taken into consideration. The cruise berth will open for the 2020/2021 summer cruise season. Q: What have you done to inform the community about the cruise berth construction? Developed Harbourwatch (www.lpcharbourwatch.co.nz), a website with the latest up-to-date information on the cruise berth and channel deepening projects. Harbourwatch also provides daily up-to-date information on piling activities in the harbour. Placed cruise berth stories in LPC’s community newspaper, the ‘LPC Update’, which is included as an insert in the Bay Harbour News. Interested parties can ask questions via an email and phone contact on Harbourwatch. A fortnightly electronic newsletter is distributed to all Lyttelton community groups. Informed the Lyttelton community of the noise impacts, via a mailbox drop, to every household in July. Held a well-publicised information day at ‘Port Talk’ – the company’s information centre in Lyttelton. This was held on 30 June 2018 for any questions on the project. ‘Port Talk’ is open every Friday, from 11am to 1pm. Q: LPC will undertake soft starts to pile driving, but research from a report by University of Otago thesis student Eva Leunissen found that dolphins were still present despite soft starts on the Cashin Quay 2 development. Does LPC believe soft starts are efficient? Soft starts are considered to be a useful mitigation measure and one that LPC does implement. As set out in Eva’s thesis, the best approach is to reduce source noise. The redesign of the cruise berth has successfully achieved this with 100 times reduction in the source energy per pile. Q: Are dolphin experts part of the cruise berth information group? The cruise berth information group is an industry team whose focus is on the operational functionality of the cruise berth. They are not involved with the construction aspects. Q: What experts are you working with?